Cardboard doors serve a variety of purposes. Opportunities for creative play with lemonade stands, ticket booths and playhouses are enhanced when a simple door is incorporated into the design. 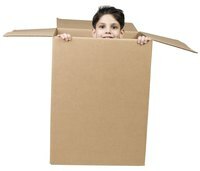 Cardboard doors can be incorporated into a structure or be placed against a wall to support make-believe play. Making a cardboard door is a simple and inexpensive project. Trace the outline of a door on a piece of cardboard. Draw the top of the door straight or round. Draw the door large enough for a person to fit through the door. Use a box cutter knife to cut the top, bottom and one side off of the box. Fold the cardboard along the fourth side to create a hinge. This will enable the door to swing while it is attached to the rest of the cardboard. Alternatively, cut all four sides of the door out of the cardboard to create a stand-alone door. Paint the cardboard door with primer. Allow the primer to dry. Paint the door in the desired color on top of the primer. Allow the paint to dry. Cut out narrow strips of paper that are as long as the door is wide. Glue the paper to the door horizontally so that they appear to be cross boards.